"For its breadth of vision and attention to detail, The Nyingma School of Tibetan Buddhism has become a standard and classic in its field. The translators and editors of these volumes studied and consulted with the author, Dudjom Rinpoche, before presenting the public this readable, systematic introduction to the whole of Buddhism from the viewpoint of contemporary Nyingma scholarship. Due to the scope of this work, [it includes] supplementary reference material (including visual images) to aid the reader. Several specialized bibliographies, a phonetic Tibetan-to-English index, a comprehensive table of contents, and a thoughtful introduction add to the efficiency of this exceptional work." "A landmark in the history of English-language studies of Tibetan Buddhism." "H. H. Dudjom Rinpoche (1904-1987), the supreme head of the Nyingma Order, was unquestionably one of the most extraordinary Tibetan Buddhist masters of the twentieth century. Highly realized, he also was a greatly accomplished scholar, whose numerous writings contributed substantially to the preservation of the Nyingma heritage. This foundational work comprises two 'volumes'--the texts and the reference materials. Volume One includes two treatises, here called 'books,' with the first book (pp. 3-382) covering the fundamental teachings of the Nyingma Order and the second book (pp. 383-973) representing the most comprehensive history available for this oldest branch of Tibetan Buddhism. Volume Two, consisting of the reference materials, makes up the rest of this enormous compilation, which includes numerous photographs, line drawings, and maps--an outstanding achievement for the author, the translators, and the editorial team of Wisdom Publications. In his first treatise, Dudjom Rinpoche explains the key concepts of nirvana and samsara along with the source literature relating to them, the important notion of Buddha bodies, the three vehicles, Buddha Families, the two truths according to Madhyamaka and the source literature relating to the 'causal' vehicles, the Secret Mantra Vehicle (Vajrayana) and its various levels and most important source texts. The second treatise has a historical orientation but necessarily also includes matters of philosophical and practical interest. Dudjom Rinpoche begins his treatment with the original teachings of the Buddha and the patriarchs of the early Buddhist Sangha. He next focuses on the rise of Vajrayana and its lineages of Mahayoga, Anuyoga, and Atiyoga. He describes the development of the many-branched Nyingma Order in incredible detail, paying attention to all its lineages and providing valuable biographies of their many masters from Padmasambhava to Mipham. A whole section is dedicated to rectifying classic misconceptions about the Nyingma tradition, and another section provides a concise chronology extending from the Buddha's life (who is assumed to have been born in 962 B.C.) 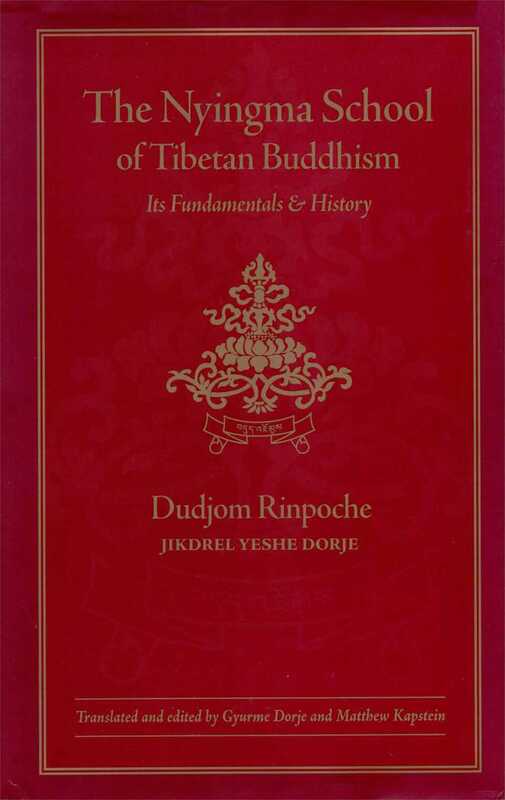 to 1987 A.D. Gyurme Dorje, the principal translator, has rendered a helpful yeoman's service, especially for lay readers, by furnishing this tome with a systematic introduction that expertly maps out the contents of the doctrinal discussions found in the first treatise."